I'm sad. And I'm confused! First off I just have to say me heart goes out to everyone involved or affected by yesterday's Boston Marathon tragedy. My heart literally hurts, and I just don't understand. :( So sad, so so so sad!!! Which would you choose? I think forest flowers or spanish rose for me! I just discovered Rifle Paper and did a post about all the great stuff they have. My new iPhone case is on it's way! These are adorable! I also need a 5, I find so many adorable cases only to realize they won't fit my 4! So not fun right?! We should just march out there and get one - all in the name of cute cases right?! I love the golden bouquet! So pretty! And on a separate note -- thank you for the warm spinach salad recipe! Made it last night and it was GOOOD!!! oh you did?! YAY!!!! I love love that salad, I could go for one right now! I seriously need a new iPhone case and these are gorgeous! These are gorgeous. 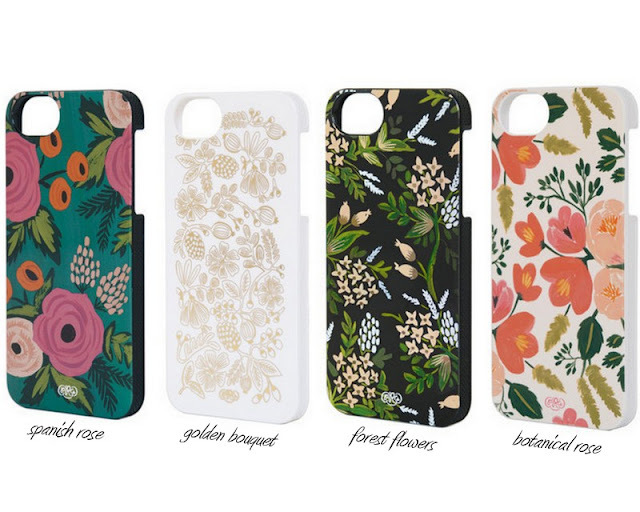 Although I want everything from Rifle Paper Co; I shouldn't expect their phone cases to be any different. I'm with you...so saddened and sickened over yesterday. I will never understand why people are so senseless and awful!! Die sehen alle schön aus, aber das golden bouquet ist mein Favorit.